Why has this course been developed? The transfer of personnel at sea is a daily activity in the shipping industry. However despite a culture of safety, associated national / international legislation and guidance, transferring personnel at sea still results in serious injury and fatal accidents both here in the UK and abroad. As a consequence there exists the requirement for specific passenger transfer at sea training for personnel undertaking this high-risk activity. Passenger transfer at sea training is primarily aimed at personnel who as part of their professional duties, may be expected to embark / disembark vessels at sea using a pilot / ship’s boarding ladder. This may include for example actual ships crew, whether experienced or new to the shipping industry, harbour pilots, marine systems engineers or emergency services. In addition, it is our experience that company management teams are often unaware of the hazardous passenger transfer at sea environment. As a consequence health, safety and human resource managers of marine systems manufacturers who dispatch employees onto vessels whilst at sea, are encouraged to attend in order that passenger transfer at sea policies and procedures can be appropriately developed in accordance with current legislation and incorporated into company management systems. In many instances ship transfer personnel are not professional mariners and therefore have little or no experience of being at sea and the associated hazards. 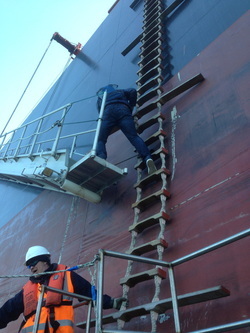 During a passenger transfer at sea operation, personnel may be expected to board a large high sided vessel using a free hanging ladder and climb to height unsupported whilst the vessel is underway. This may take place in the hours of darkness, in poor weather, rough sea conditions and low sea temperatures. This is a daunting prospect for anyone, particularly if not appropriately trained, potentially exposing employees to high personal injury risk and employers to high liability risk. Associated transfer at sea hazards and the effects of these hazards are numerous and difficult to control in a dynamic maritime environment. However to minimise risk, the likelihood of encountering the potential effect of these hazards can be greatly reduced through appropriate education and practical training. This will reduce the likelihood of injury, contribute to employee duty of care compliance responsibilities and raise general safety standards in the maritime and crew / passenger transfer industry. What does the training involve? The passenger transfer at sea training is a one-day course comprising two half-day modules. Module 1 is classroom instruction; module 2 is practical training afloat involving the use of a ship’s / pilot boarding ladder to disembark and embark from an actual passenger transfer vessel. Where appropriate to professional role, certain personnel may only require participating in module 1. To help minimise workplace disruption, module 1 can be conducted at a client’s location / facility, thus reducing the time staff are away from their workplace. For personnel who also require practical training afloat, at a later date module 2 can be conducted aboard one of our passenger transfer vessels located in Stonehaven, Aberdeenshire. What is the training outcome? The training outcome is personnel who are better prepared to undertake hazardous ship transfer operations. This is achieved through the delivery of a formal, structured and safe training curriculum that provides the knowledge, basic skills and practical experience necessary to facilitate the minimisation of risk when at sea. What is the related experience of the training staff? McLachlan Marine Services is Aberdeen’s premier and longest serving provider of passenger / crew transfer services, who with RNLI lifeboat crew on staff, prides itself on high maritime safety standards. Haynes Marine is a renowned defence industry maritime training provider, RNLI inshore lifeboat coxswain, Royal Yachting Association advanced powerboat instructor and passenger / crew transfer vessel skipper. The consequence of this collaboration has been the development of a unique, safe and realistic maritime training package delivered by trainers highly experienced in the challenges of passenger transfer at sea operations and the management of associated risk.